The Philips HeartStart FRx Defibrillator is designed to be easy to use, rugged, and reliable for those who get there first. On the scene with law enforcement, on the field with student athletes or on the job with employees, the FRx Defibrillator is the solution for treating Sudden Cardiac Arrest (SCA) from ventricular fibrillation in environments and conditions too demanding for many other defibrillators. At the core of all HeartStart Defibrillators is SMART Biphasic technology. The HeartStart FRx Defibrillator’s biphasic waveform delivers a highly effective defibrillation shock that is also gentle to the heart. No other external defibrillation therapy has been supported by more published clinical data. SMART Analysis, a proven Philips technology for heart rhythm assessment, ensures that the FRx Defibrillator only shocks when it should. SMART Analysis automatically assesses the victim’s heart rhythm and is designed not to deliver a shock unless the rhythm is determined to be shockable – even if the shock button is pressed. What’s more, SMART Pads II enable the FRx to keep pace with the responder by adjusting to their actions. 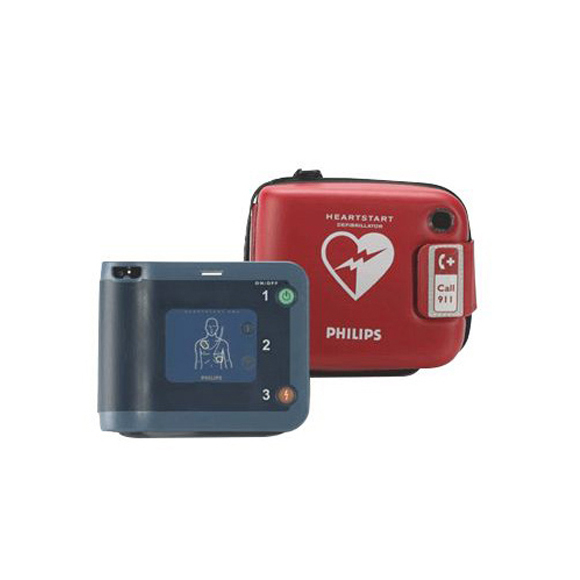 The HeartStart FRx Defibrillator was designed to be as easy as the HeartStart OnSite Defibrillator and shares many of its features, including CPR Coaching and intuitive icon-driven operation. Although small and lightweight – just 3.5 pounds – the FRx is equipped to guide you through the resuscitation of a SCA victim. The HeartStart FRx guides you through every step with clear, calm voice commands and descriptive visual icons. The FRx even reminds you to call emergency medical services (EMS). 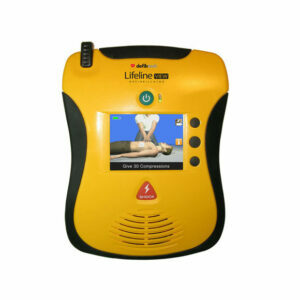 Pressing the blue i-button activates HeartStart CPR Coaching for assistance with CPR. The flashing icons and the Quick Reference Guide can be used to lead you through the defibrillation steps – even in situations where hearing voice instructions is a challenge. Once EMS arrives, hand-off is fast and easy because the FRx is compatible with advanced defibrillators like the HeartStart MRx. With HeartStart adapters, pads can be plugged into devices from other manufacturers to ensure continuity of care. Reliability backed by Philips. The HeartStart FRx Defibrillator is powered by an easy to install, long-life (four-year) battery, so you know the device is charged and ready. The device’s automated daily, weekly and monthly self-tests check the pads readiness, and verify functionality and calibration of circuits and systems. With over 85 tests, the FRx is one of the most comprehensive self-testing devices on the market and is virtually maintenance-free. 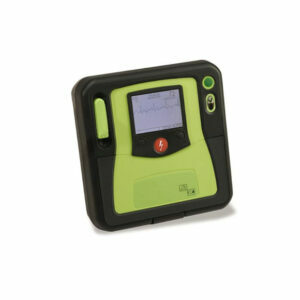 The blinking green “Ready” light on the defibrillator is your assurance that the device is ready for use. Artifact detection allows ECG analysis even in the presence of most pacemaker artifacts and many other electrical noise sources. When more challenging sources of artifact are detected, the voice prompts suggest corrective action. SMART Pads II can be used for both adults and children. Simply insert the Infant/Child Key into the FRx to signal to the device that you’re treating an infant or a child. 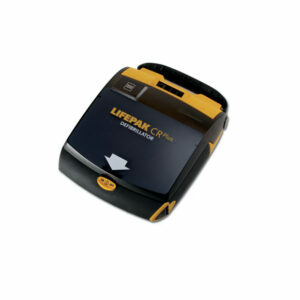 The defibrillator adjusts its Life Guidance to provide special pads placement and CPR instructions. 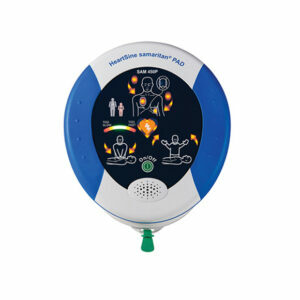 The pads icons also flash to show you the optimized pads placement, and the device reduces defibrillation therapy to a level more appropriate for an infant or a child. Because you don’t have to switch pads based on the person’s age, you can deliver therapy quickly, and you don’t have the extra expense of purchasing separate pads for adults and children.